This smart and stylish downstairs apartment, situated in a private garden setting, offers you panoramic views over the city to Wellington Harbour and out to Cook Strait. Located in picturesque Kelburn, its only a few minutes walk to the local Village, with its cafes and restaurants, pub, grocery store, bakery, deli, butchery, hairdresser, beauty salon, antiques shop and more. The central city is within easy reach. A 10 minute walk will take you to the top of Wellington’s famous Cable Car or, if you prefer to catch the bus, the nearest stop is a stone’s throw away. The Botanic Gardens, Carters Observatory and Zealandia are all within walking distance. The one-bedroom apartment can sleep up to four people, with a queen-sized bed and a fold-out sofa bed in the living area. A portacot or single mattress to go on the floor are available on request. There is a dining table and four chairs. The apartment is accessed via an uphill walkway from the street, which includes around 40 steps. Parking is available on the street. Privacy and breathtaking views within easy reach of the city are hard to come by. So come for a weekend, a week or longer and make Fairview apartment your haven in Wellington. 1. No pets. 2. No smoking in the apartment. 3. Maximum of 4 guests, children welcome. 4. Access to the apartment is via an uphill walkway, which includes around 40 steps. 5. Coupon parking is available on the street ($7.50 per weekday, first two hours free; weekends free). 6. Weekly and longer-stay rates available. Fully equipped apartment with unlimited wifi access, washer/dryer, dishdrawer, and cable TV. The bathroom is located off the living area and has a shower and hand basin. The toilet is located separately and is accessed via the bedroom. The apartment is heated with water filled radiators. It is warm and cosy. Feather duvets and cotton sheets are used on the bed and the sofabed. The bed has an electric blanket for those who like to be super cosy! The washing machine is a combined washer/dryer. It is a front loader. Parking is available on the street. Parking is free overnight and on weekends. Between 8am and 6pm on weekdays, the first two hours of parking is free. Then a coupon is required. These cost $7.5. There are plenty of soft fluffy towels for your use. The living room is open plan and includes the dining area, sofabed and kitchen. There is a coffee bean grinder and a plunger provided. Oil, salt, pepper, butter, jam, coffee beans, tea bags, breakfast cereal and sugar are provided. There is a collection of books and magazines for you to enjoy. If you have small children, please let me know and I will provide toys. There are some DVDs provided. The apartment is accessed via an uphill pathway which includes 40 steps. It is not suitable if you have heavy suitcases, high heels or have mobility issues. So quiet, comfortable bed, plenty of space for a couple. 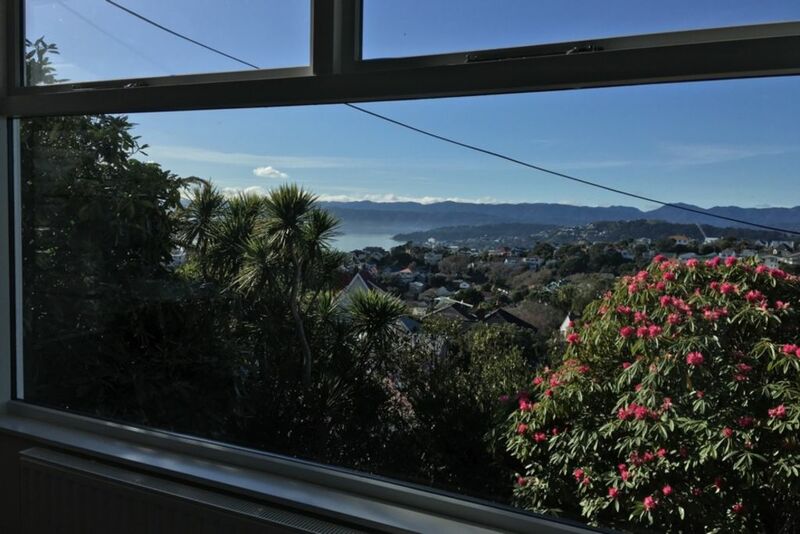 View from living room is fantastic and location is very convenient for botanic gardens, Zealandia and cable car to CBD. We absolutely enjoyed staying at this home and we can recommend it to anyone who is looking for a great stay in beautiful Wellington. There are so many things to do around here and our only regret we have is the short duration of our stay, we would have loved to be able to stay here for a little longer. It was cozy and comfortable, everything we needed/expected was in the home. Thanks for letting us stay! Thanks for your positive feedback. I hope we will see you again in the future! The description on the site is a fair representation of the property. The property is well equipped clean and tidy. Stunning views with a contemporary feel. The host was most helpful and we loved the accessibility to food, botanical gardens, cable car, restraunts and shopping. We cracked the windows and it was quiet and peaceful. The stair steps kept us in shape and uber was always available. Thanks for your lovely comments. I’m glad you enjoyed your stay and I hope we’ll see you again in the future. Great apartment. Very clean amd comfortable and a great location, close to most everything. Owner very nice and helpful! One drawback is the stairs. Don't get me wrong, it is clear in the listing!! I only bring it up because i think it might be difficult for older folks with luggage or women with giant luggage! We stayed at about 8 places in our travels throughout new New Zealand and this one was in our top 3! The apartment is a 5 minute walk from Kelburn Village and a 25 minute walk to the CBD. It is a 5 minute walk to the Botanic Gardens and a 15 minute walk to the cable car. There are buses from Kelburn Village into the city. Zealandia and Carters Observatory are also within walking distance. Kelburn Village has a pub, restaurants and cafes, a well stocked grocery store, a bottle store, a butcher, bakery, hair dresser, a beauty salon, a small gym and clothes shops.